You’d think that having spent three weeks in Lima (a two week block and then another week later on), I’d have plenty to tell you about it. But I don’t. Week one had been when we realised that hey, we were in South America now, and would be for a good three and half months to come, so perhaps we should figure out what the hell we intended to do here, yeah? Ie we spent our time picking where to go: where to visit the Amazon (we picked Iquitos, and went in the week between weeks two and three in Lima), whether to visit the Galápagos Islands (yes! ), when and how to go to Machu Picchu (after the Galápagos, bizarrely, by train, not trek, to save time), how much time to spend in Bolivia (as much as we had left), etc. 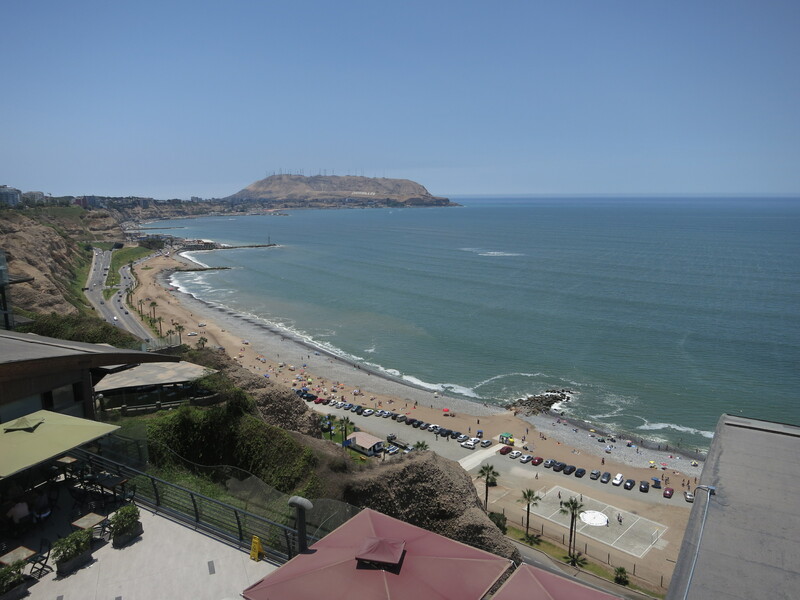 So in all that time, and much to the chagrin of my lovely Spanish teacher, we pretty much didn’t leave the central tourist area of Miraflores. Well, except for me to buy a new camera after my Powershot S100 stopped working in the Amazon. If the Canon repair centre and Sony Store had been closer in, the only times out of the centre would have been to the airport and for a Spanish-school-organised excursion. Embarrassing, really. Apparently I’m not very good at this tourism thing. Arabica Café serves the best espresso coffee I’ve had since I was in Italy. Seriously. I’m a picky coffee drinker. It’s fantastic. Lima has a light and sound show at the fountain park, much like Singapore does in its marina. Lima’s is better. Impressive stuff. 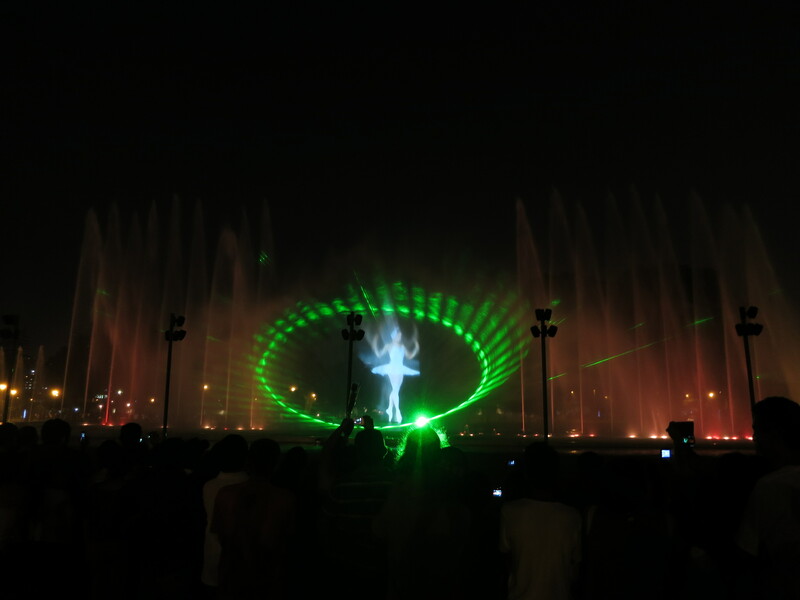 A scene from the light and sound show at Lima’s fountain park. Very impressive. Lima airport is a long way from Lima. Sufficiently so that the airport is not actually in Lima, it’s in Callao. Callao is a shithole. Lima airport oneworld lounge (well, the third-party lounge that you get access to) needs more power outlets and better food. The entry area for security screening at Lima airport is very annoying, and typically surrounded by millions of people who’ve apparently picked it as the most convenient place to do their farewell hugs and kisses. I’m far too familiar with Lima airport. This is because we flew in or out of it a grand total of ten times over eight separate visits to the airport. Not that I was constantly trying to get out of Lima or anything. Miraflores is actually quite nice, as far as touristy bits of big cities go. I liked it. Good ceviche (raw fish marinated in citrus juice in lieu of cooking) is delicious. But that’s about it, I’m afraid. Some travel blogger I am. Guess you’d better hope that I do something more interesting in the rest of my time in South America, yeah? This entry was posted in Travel and tagged lima, peru by Sam Roberton. Bookmark the permalink.